Elizabeth was upset this afternoon because Daniel’s class went to the Satrosphere and he got a small toy. She was jealous because she didn’t get a toy. 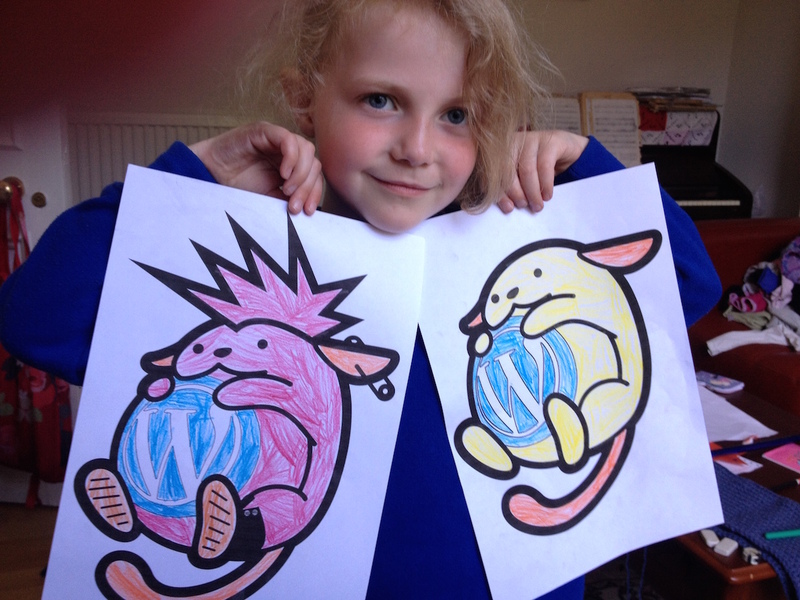 So to take her mind off it I decided to print out these cool colouring-in pages of Wapuu and Wapuunk which my co-worker shared on his blog last month. The effect was immediate: she went from crying uncontrollably to very proud of her efforts in the space of about 10 minutes. Yay for Wapuu and Wapuunk! This of course means that Sandy, creator of child-soothing colouring-in pages, is now being nominated to take up the five-day challenge. I was nominated by Geoff Le Pard at TanGental. Posted in Journal and tagged coloring, colouring, five day challenge, kids activity, wapuu, wapuunk, WordPress. Bookmark the permalink. She’s a little Rachel! Perfect clone in small size! And she’s adorable!! She does look quite a bit like me and Daniel looks like Ben. Good job! Nobody is dissatisfied! Yep, no doubt of the mum there; love the distraction technique – hope it still works in ten years! I think it will lose its effectiveness over time. You’ll find other tactics as will she. He is very cute. My kids asked me whether there’s a movie about him. Maybe there should be? A bit. Wapuu is cuter.